Ready to make your dreams come true? Call us today and make an appointment with our Design Team. Just ask for Dave. 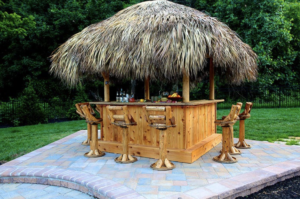 Are you looking to build a custom outdoor living area where you can relax and enjoy evenings and weekends with your friends and family? 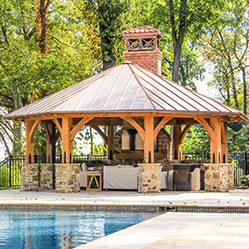 Greenview Designs Landscaping can design the perfect custom outdoor living space to fit your landscaping and Central NJ hardscape needs. 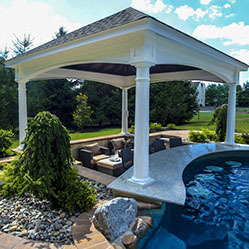 Greenview Designs can design and build your custom gazebo, patio, pergola or poolside cabana. Many people simply enjoy spending time outdoors. But did you know that science proves that being outside is not only fun and enjoyable, but great for our health physically and mentally? That's right, the benefits of simply being outside in nature are many and are absolutely impossible to replicate indoors or with man-made creations. Being surrounded by nature can has profound positive effects psychological and mental health. By simply being in the presence of trees and greenery, we can increase production of feel-good brain chemicals such as serotonin, dopamine, endorphins, and oxytocin. The key to strengthening these chemicals in our brain, and therefore increasing happiness, is by focusing on positive thoughts and feelings. Numerous studies have been conducted that have proven that being outdoors provides more positive feelings than any urban or interior setting, and that every type of green environment can improve both self-esteem and mood. When water is in close proximity, these positive feelings are multiplied. What’s more is that being outdoors can lower stress-inducing chemicals such as cortisol and adrenaline and increase our feelings of empathy and love, while in contrast being indoors can actually increase feelings of anxiety and fear. Spending time in a forest atmosphere has been shown to increase creativity and productivity. Studies have shown that participants who took a stroll in nature scored the highest on a variety of aptitude and creative problem-solving tests. Office workers who possess just a decent view of wilderness from their desk have been proven more productive and successful in their roles. In addition, children who spend time outdoors playing have shown increased ability to concentrate and to better manage symptoms of ADHD. Being exposed to the outdoors can bless us with physical health benefits as well. Plants release airborne chemicals to purify the air and fight insects. These chemicals boost our immune system and help fight diseases such as cancer. Our bodies require Vitamin D for necessary functions such as bone and cell growth and inflammation reduction. This vitamin can be difficult to obtain from food; therefore, natural sunshine is the best source for our bodies. In addition, spending a good portion of time in natural, outdoor lighting can help prevent vision loss and nearsightedness. There are many other practical benefits to having an outdoor living area. Firstly, it is a great investment! 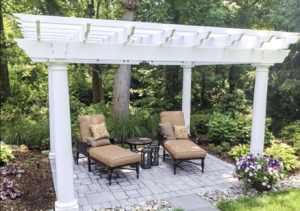 As an extension of your home, an outdoor living area has the potential to increase the value of your home, and it provides a great place for you to do the things you enjoy! 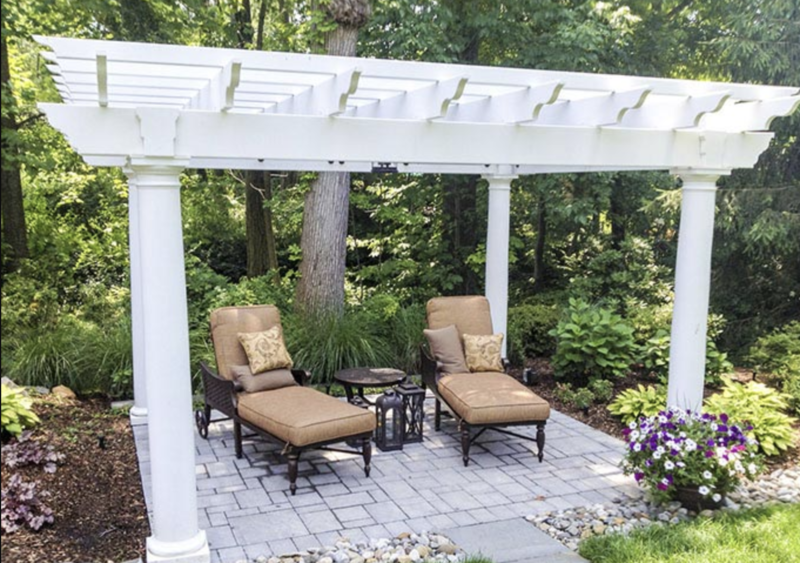 This outdoor space can be customized to fit your lifestyle. Whether it’s a bar, grill, pool, kids play area, or patio seating (or a combination of it all), it’ll be a great place to entertain friends and family. It will also be a wonderful way to increase the time you spend with your kids. 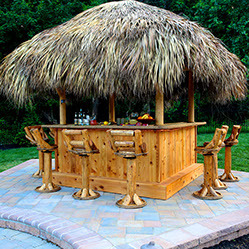 Add family friendly features like outdoor games or a play area. Or use the space to create a dining area for family dinners. It can be hard to get the whole family to sit down for a meal, but the cool environment of an outdoor space will help.